A surprise gem, Bandstand transcends its simple premise to deliver a compelling story with terrific music and performance energy to spare. A returned WWII serviceman forms a swing band to win a national competition, finding love along the way with his best friend’s widow. Although this description gives the sense that the ensuing show may be flat, corny and predictable, nothing could be further from the truth. Book (and lyric) writers Rob Taylor and Richard Oberbacker have laced the story with ongoing tension and high stakes drama, creating an engaging set of characters and a gripping storyline. 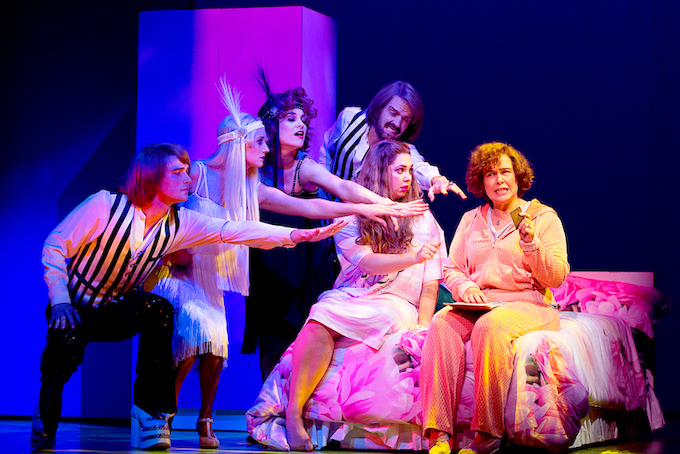 Such is the audience’s involvement in the show and attachment to the characters, climactic song “Welcome Home” receives an extended standing ovation. Oberbacker also wrote the instantly enjoyable, toe-tapping music, which is crucial to the show given the focus on songwriting and forming a band. 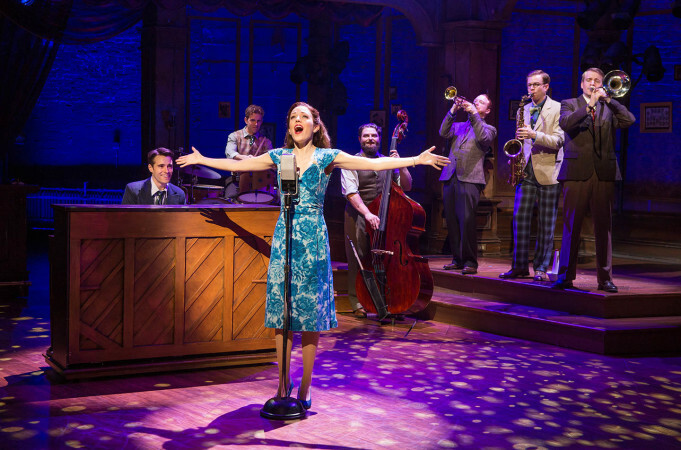 While the actors play their character’s instruments on stage, there is also a pit band. 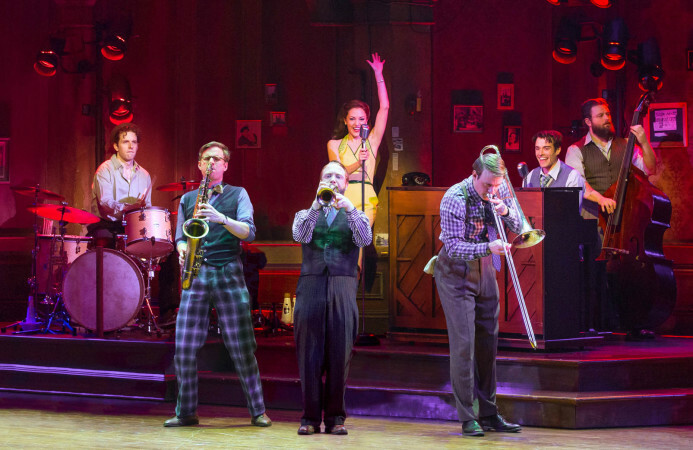 With the focus on brass and woodwind, the music has an exciting “live” sound that matches the energy emanating from the cast’s passionately enthusiastic performances. The quality of the writing is well and truly matched by the thrilling direction and choreography of Andy Blankenbuehler, Tony Award winner for choreography of In The Heights and Hamilton. 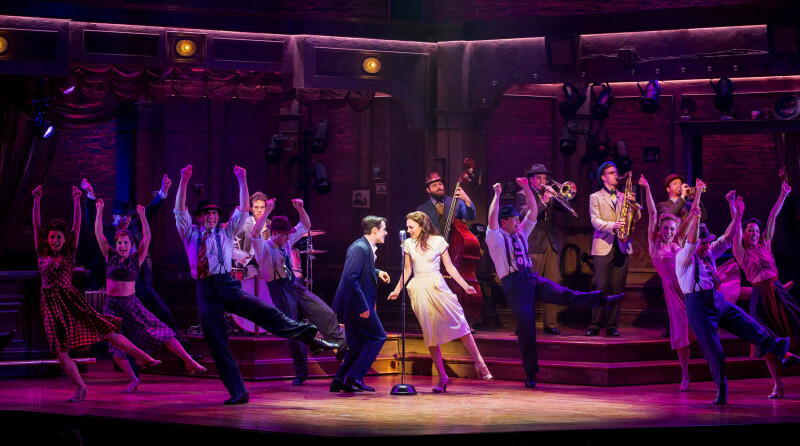 While Bandstand is a more traditional book musical than Hamilton, Blankenbuehler has nonetheless imbued the show with relentless energy, with dancing not just in every scene but also in every scene change. As well providing sensational choreography for individual songs, such as act one company swing number “You Deserve It,” Blankenbuehler excels at creating sophisticated montages, abandoning the spoken word for dance in much the same way Agnes de Mille did in the 1940s. The show is blessed with two outstanding lead performers, both of whom are proven talents, if not yet household names. 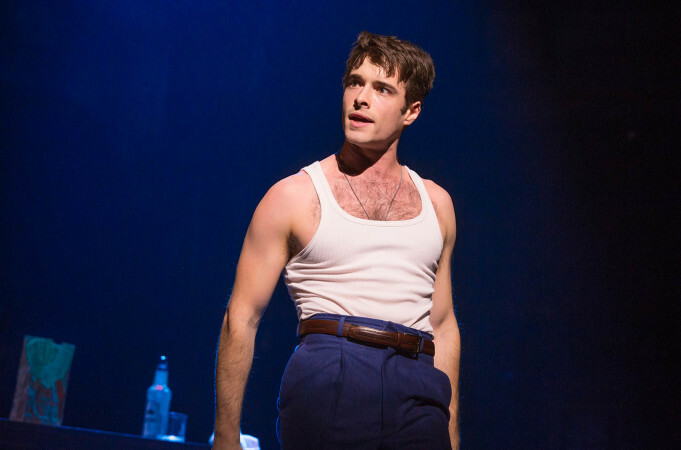 Corey Cott is magnetic as alpha male band leader Donny Novitski, who drives the action with unflagging determination. The ruthless manifestation of this drive gives Donny an edge over and above a simple Broadway hero. A brief prologue shows Donny’s experience in the war, a scene that returns periodically to haunt him. Faced with a major setback near the end of act one, Donny’s repressed PTSD bubbles to the surface and he suffers a meltdown, The experiences of all the ex-military characters have a resonance today, of course, for current returned servicemen and women. 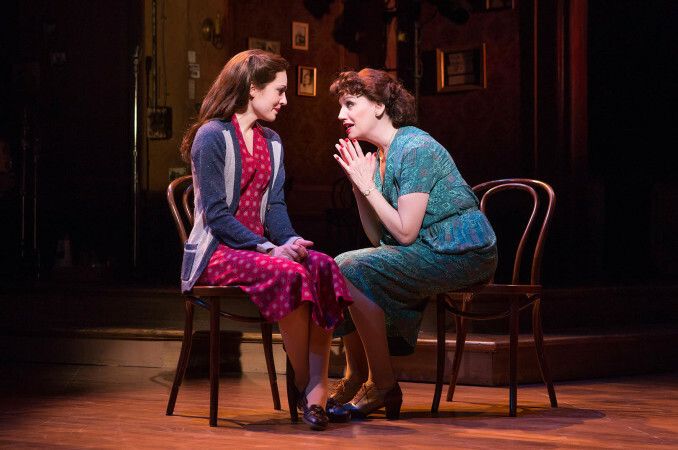 Laura Osnes brings her gorgeous voice and raw vulnerability to the role of widow, and incredible singer, Julia Trojan. 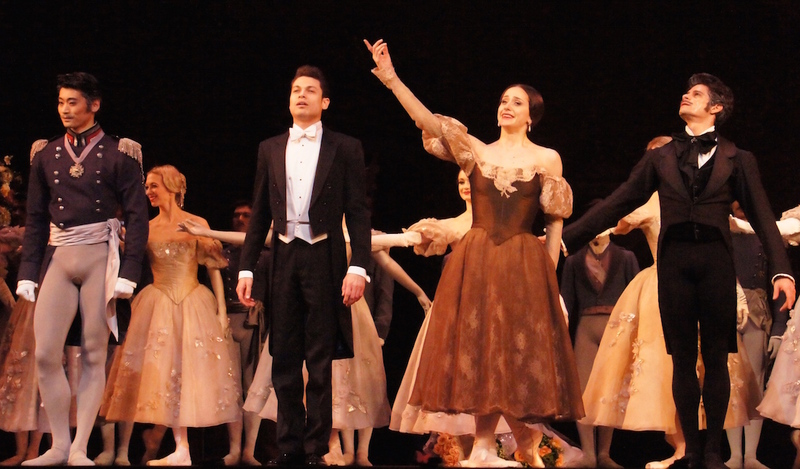 Osnes and Cott enjoy great chemistry, and their portrayal of the inevitable romance benefits greatly from the very slow burn of the relationship. Each of the band members has a distinctive character, all shaped by their wartime experiences and the period. Alex Bender’s Nick (trumpet) feels diminished to be only working as an instrumental teacher. Joe Carroll conveys the slow caution of injured drummer Johnny. James Nathan Hopkins plays Jimmy (saxophone) who has immersed himself in studies of law. Geoff Packard amuses with the obsessive-compulsive tendencies of Wayne (trombone). At this performance, Matt Cusack played high-functioning alcoholic Davy (bass). Cherished Broadway character actress Beth Leavel reliably brings delightful humour to the role of Mrs June Adams, Julia’s mother. 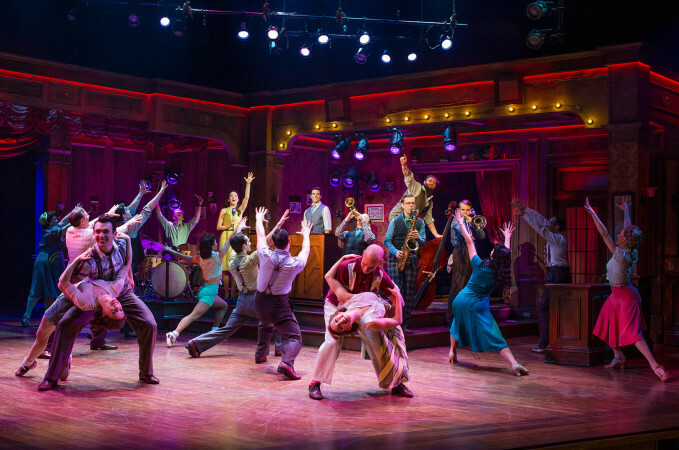 There are flashier, more eye-catching new shows and revivals this season, but Bandstand is very highly recommended as an exciting piece of musical theatre. Bandstand was reviewed 2pm Saturday 8 April 2017 at Jacobs Theatre, New York. Official opening night is 26 April 2017. Simon – just back from Bandstand and Hello, Dolly! on Broadway based on your recommendations. Both shows were outstanding. 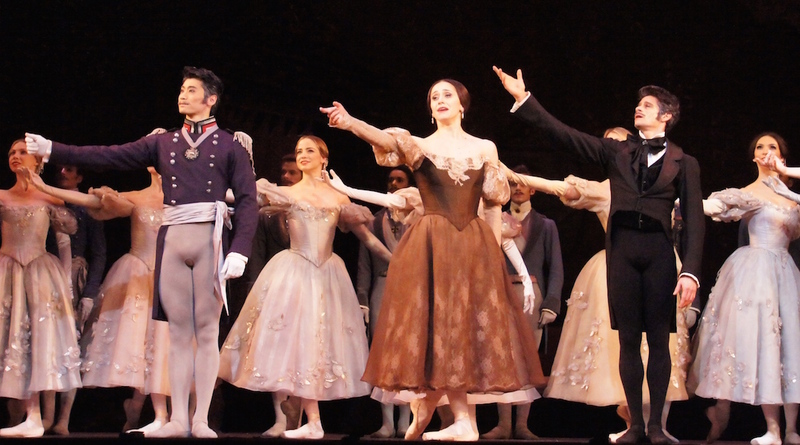 Especially enjoyed the choreography and the precision of the dancers. Donna Murphy was a brilliant replacement for Bette Midler. Thrilled to hear this update, Rob. Great pair of shows to see, certainly the best of the current crop in terms of dance. I’ve never seen Donna Murphy live on stage.- very jealous.